Although skiing and snowboarding use the same physics and mechanics, there is one major difference between the 2 sports. Skiing uses 2 skis, whereas snowboarding only has one snowboard. This means that with skiing you have 2 edges that you can use for controlling yourself, but snowboarding only has one. Having only one edge to use when snowboarding makes a big difference in one situation in particular. When you are trying to slow yourself down, without moving sideways. With skiing you can put your skis into the snowplough position, and the sideways forces from each ski will cancel each other out, slowing you down but yet keeping you going straight forwards. 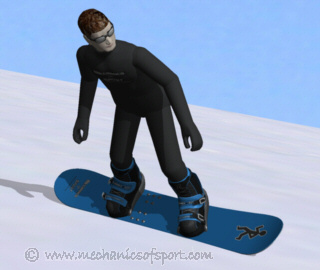 On a snowboard though, if you are going to slow down you have to move sideways at the same time, because there is no second edge to cancel out the sideways forces (creating resistance). This means snowboarders need a wider area than skiers do for them to be able to control their speed properly. A skier faces straight forwards along the skis which puts a skier's blind spot directly behind them, but a snowboarder stands sideways on the snowboard making their blind spot more to the side of them than behind them. This is something you should also take into account around snowboarders as if you are not carefull you can come to more or less along side a snowboarder without them realising you are there. Obviously the side that a snowboarder's blind spot is, is always the side that their back is facing, which will change depending on which way round they are standing on the snowboard (i.e. whether the snowboarder is regular or goofy). Because of snowboarders' limitations it is important to always make sure you give snowboarders enough room, as they need more space sideways to be able to control their speed, and they have less awareness on one side. If 2 skiers box in a snowboarder from each side, leaving the snowboarder no room to move sideways, and the snowboarder loses control making everyone crash, it will have been the skiers' fault that it happened not the snowboarder's. It is very important to know this, as many skiers are very ignorant towards snowboarding, and their lack of understanding can make them a real danger to the piste and its users. Another difference between snowboarders and skiers is their mentality. Although everyone is different and this is not always true, there is often a difference in the general mentality of skiers and snowboarders. There are a few reasons for this difference in mentality, 2 of the largest being age and equipment. Snowboarders are generally younger and just like most younger people are not so afraid and more willing to try crazier things. This is not as true as it was several years ago, since skiing is making a comeback with younger people, but snowboarders still tend to be younger rather than older. Then there is equipment, because a snowboarder has both of their feet attached to the snowboard it makes it a lot easier for them to throw their weight around than it is for a skier. This makes things like ollying and small tricks a lot easier to do on a snowboard, and also means that snowboarders can perform small tricks and jumps off of very small lumps and features in a piste, or even on the flat. So what on skis might be a plain slow boring piste can still be a lot of fun on a snowboard. Snowboarders tend to be more interested in the feeling of snowboarding rather than where they have been. It's a very different feeling to snowboard than to ski, and as soon as a snowboarder finds a piste that gives them the terrain they want, they are generally happy to stay there. Skiers can treat the mountain in the same way as snowboarders do, but in order for a skier to do that they have to be a lot better at skiing than a snowboarder has to be at snowboarding to do the same thing. This level is also far above how good the average skier is, so it is not so common. This helps explain why skiers and snowboarders can get in each others ways from time to time, as skiers are always stopping where snowboarders are planning to jump or do small tricks, or getting in the way on flat areas where snowboarders need to keep their speed to get across (they don't have poles). Then snowboarders are always sitting in the snow at the top of lifts, or at the side of pistes if they need to stop. At the end of the day though as long as everyone sticks to the rules of the piste, there shouldn't be any problems. On to the How to Use This Website page.